Buy a Carter's Display Case - XL Edition (found under Buy Mode > Surfaces > Storage). For the large case you need to place 8 items; the small case requires 10. 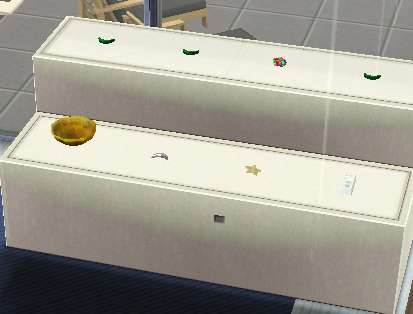 You can also use a Carter's Display Case on a Community Lot, if available, but it costs 2500 a time. Items to be transmogrified may need to be prepared. Gems must be cut, either by sending them off (mailbox) or more cheaply (ie free!) by using a Gem-Cutting machine. Sim still has to acquire skill with higher-value cuts, which takes some time. Minerals have to be smelted, which you can only do by sending them away, unless you have access to the PRISM Premium object. Fossils and Relics do not need any preparation. If your input materials are ALL gems, metals, or rocks, what is produced will be of the same type, ie gem, metal or rock, respectively. Large space Rocks do not combine to make still larger ones, and the value of them combined is less than the individual value, so once Analyzed in case they increase in value, they should probably be sold, unless you like them for a rockery. NOTE: Transmogrification recipes seem to vary according to which EPs and\or SPs are installed. Fill the stand with mixed items to the value of between 3500 and 4999. Result is a Tiberium. Carl's guide says uncut tiberium. I usually get a small Spire-cut tiberium, worth about §6,000. See Tiberium for how to increase the value of this.